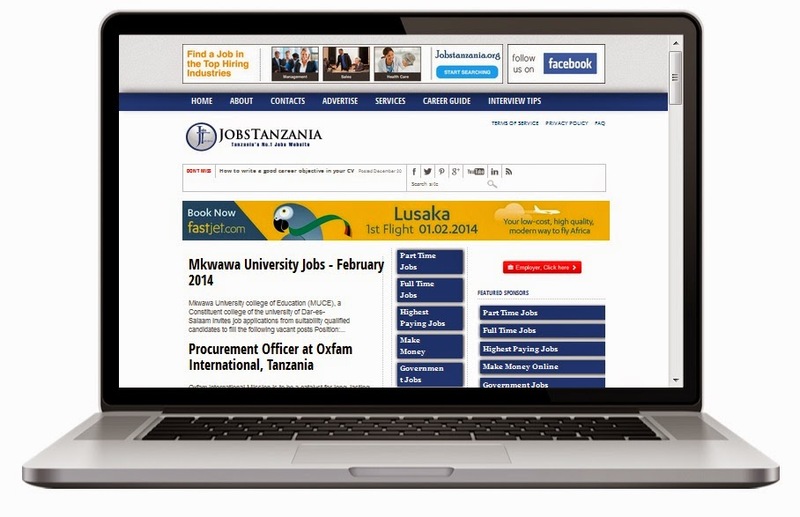 If you don’t want to go through the hustle of buying newspapers for local ads in Tanzania, asking your friend if there are any opportunities he or she has heard of, there is an easy shortcut, sit down’ relax, click on the browser on your computer and look for jobs online, its as easy as that. So her is what you have to do, Just open your browser, with all these websites emerging everyday, where do you start searching for your dream job, or just a part time job to keep the food on the table? With the ever growing internet community here in Tanzania, most businesses are moving up to the internet for most of its solutions. Many companies offer jobs online, and people get to apply for these jobs online too, directly via job listing websites, you get to apply for jobs right on these websites. Bongotoday.com is here to provide you with the best job listing websites in Tanzania. Search and apply for you dream job on these websites. Brightermonday is the best site out there when it comes to finding a job online, the website design is magnificent, I mean if I was looking for a job in Tanzania just the look would assure me that I’m going to find what I’m looking for. The name, I mean brighter Monday, who doesn’t want to have a brighter Monday after the dreadful week we have all had. Ease of access, searching for a job couldn’t not be more straight forward, you just filter the search by location and see all the job searches on the location that you are looking for, the jobs are categorized really well on the front page, categorized by category and by location. You can upload your C.V if you are looking for a job or post a job for the companies that are looking to hire. You can sign up to be alerted for any new jobs that are posted in case you did not find what you are looking for. 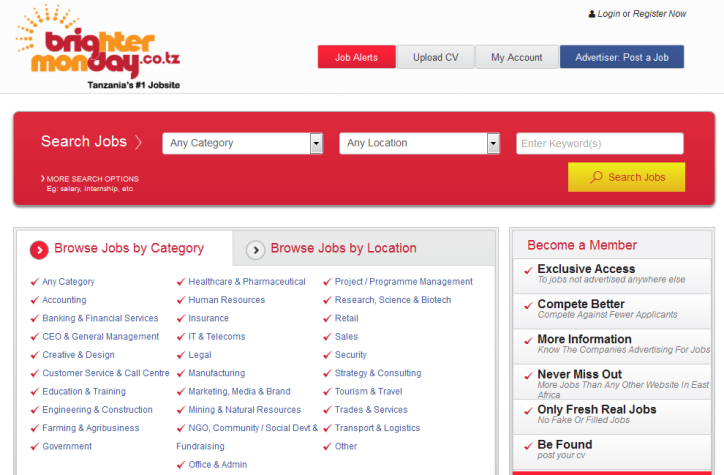 This is the best website in Tanzania if you are looking online for a job. 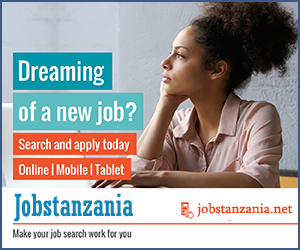 Jobstanzania is listed number two because it does not only list the available jobs in Tanzania, but also has a lot of articles on Career Advice, about how to write a CV, how to prepare for an interview and a whole lot more. 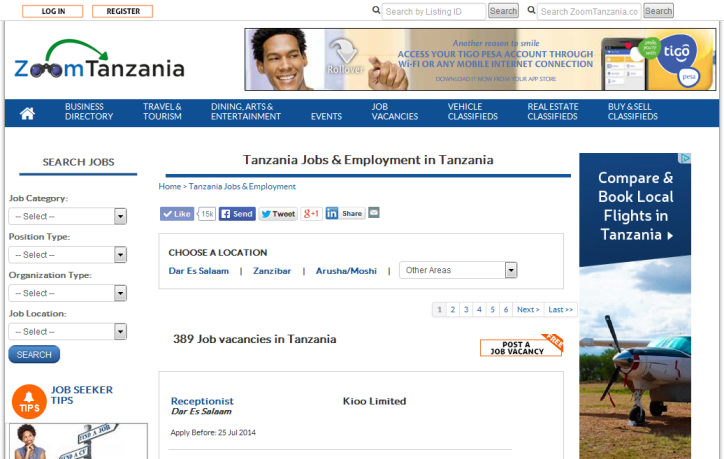 I would really advice you to take a look at this website before visiting any of the other links on this list, it doesn’t have that much functionality when it comes to uploading CV's and posting jobs, but this is a really reliable website for any one looking for a job in Tanzania, its a very informative blog to look for a job. Although this website is a directory based website, but it offers job listing services and the Job listing section is what makes this website famous than its other services provided. With this website you can add your CV and post it on their database, when applying you get options to choose on what kind of job you are looking for. You can also apply for jobs directly on the website via the Apply Button, and also for the companies wanting to post jobs they can easily do that too, they can also search for CV's to look at. These are the functionalities that a job listing website should have. Ajiraonline is a very Good website with a great design. The website has a lot of functionality, for those looking for jobs, they can upload their CVs, as well as recruiters can freely post a job on this website directly, the website has a lot of job post offers to go through. more than 3988 by the time I am viewing it, with 124 CV's already being uploaded. You may be suprised to see this at number 5 just because its a blogspot, but the only reason its on this list is because it ranks high. its has more visitors than other blogs with good domains. The site has a lot of content on it, the site has published more than 40,229 job posts by the time I am viewing it. So for people looking for a job you can try looking into it. There are many websites in Tanzania that post job adverts but I have chosen these top 5 to review for this post more will be revealed in the next post.